December 31st is one of the biggest parties on everyone’s social calendar and it’s sensible to decide where to spend New Year’s Eve well in advance. London puts on some truly spectacular celebrations, which always draw in the crowds. There is a lot going on in addition to the usual offerings from the capital’s pubs, clubs and bars, so here’s a brief guide to some of the events taking place in the city to mark the arrival of 2013. Everyone knows that the fireworks in London are something special, so if you are intending to be in the capital for New Year’s Eve, make sure you can get a good view of the amazing light show in the sky. Typically, the fireworks display focuses on the South Bank and London Eye, so this is the best place to head to if you want an unrivalled view. You don’t only get pyrotechnics, though (although those are truly breathtaking), you also have music to accompany the colourful display that illuminates the night sky at midnight. Best of all, this is totally free, so if you’re celebrating on a tight budget, it’s a great way to have a memorable evening without breaking the bank. The Hyde Park Winter Wonderland isn’t somewhere you can spend midnight, but it is a great place to begin your NYE celebrations (especially if you’re planning to watch the fireworks later on). Entry to the attraction is totally free – you just have to pay for any rides or activities you want to have a go at. It’s open until 22:00 local time, so you can certainly get your evening started in style. There’s an ice rink, a giant observation wheel, an ice and snow sculpture display and a host of rides with something suitable for everyone from adrenalin junkies to kids. There are also various shows – including a circus – you can attend, so take a look at what’s on the bill and you can begin to plan your evening. 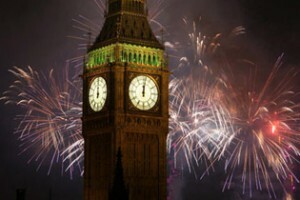 The fun in London doesn’t have to end in the early hours of the morning, as there are numerous events planned for New Year’s Day that you can attend (if you don’t have a hangover, that is). 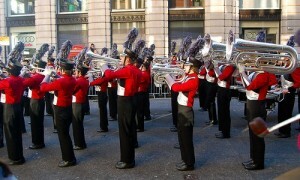 Running from 11:45 to 15:00 is the New Year’s Day Parade, which will see thousands of performers parading through London’s streets to provide all manner of entertainment. You can expect to see musicians, marching bands, acrobats, cheerleaders and clowns among the procession, which will wind its way from the Ritz Hotel on Piccadilly to Parliament Street. Once again, it’s totally free to watch the show, so if you’re hoping to keep your spending to a minimum this new year, it’s a great option to round off the festivities. While it’s lots of fun deciding where you’ll be seeing in 2013, you also need to think about the practicalities of staying in London at this time of the year. Hotels will get booked up quickly and can be expensive, so you should arrange your accommodation as far in advance as possible. Using a website like Vacenza can help you find the best available deals during busy periods. As there are lots of free events taking place, you can easily plan a getaway on a budget. Don’t forget to factor in money for food and drink though, as well as work out how much it’s going to cost you to travel to and from the capital.